Oscar. The Academy Award. Regardless of its name, it evokes the same emotion of respect for those who have been fortunate enough to receive one. And for those lucky ones, whether deserved or not, it is the brass ring, the ultimate in praise from their peers. 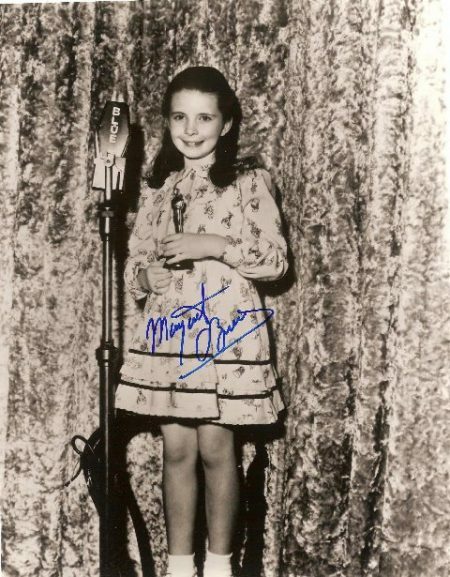 And so it was for little eight-year-old Margaret O’Brien, arguably the most talented of all the child stars of her day – or since – who received the coveted award for most outstanding child actress of 1944 for her performance in Meet Me in St. Louis (1944). The special Oscar, which was a miniature version of the acclaimed award, was given sporadically in the 1930s and 1940s. Previous winners included Mickey Rooney, Deanna Durbin and Judy Garland, who was Margaret’s co-star that year. Born Angela Maxine O’Brien, Margaret’s rise to fame was meteoric. When her photograph was seen on a magazine cover, a Metro-Goldwyn-Mayer executive signed her for a one-line scene in Babes on Broadway (1941). The powers-that-be at MGM saw the four-year-old’s raw talent and cast her with Robert Young in a war-time drama called Journey for Margaret (1942), from which she took her stage name. Small parts in three films followed until her starring role in Lost Angel, (1944) which was the first film written specifically for her. At the request of director Vincent Minnelli, the studio cast her in the role of Tootie Smith in their new Technicolor musical, Meet Me in St. Louis. MGM had big hopes for this film and spent an astronomical $100,000 to build the St. Louis street on their back lot. 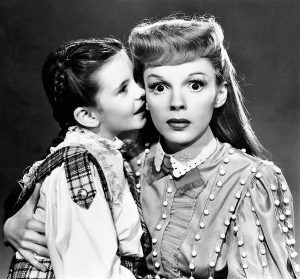 Besides Margaret, the film included Judy Garland, Lucille Bremmer and Mary Astor, and introduced such musical standards as “The Boy Next Door,” “The Trolley Song,” and the holiday classic, “Have Yourself a Merry Little Christmas,” which Garland sang to Margaret. When the film was released near the end of 1944, critics across the country praised her performance. The Hollywood Reporter claimed that she was the hottest thing on the MGM roster. The Academy of Motion Picture Arts and Sciences shared that opinion and awarded her a Special Oscar for the Most Outstanding Child Actress of 1944. At the ceremony, which was held at Grauman’s Chinese Theater on March 15, 1945, Margaret was given her Oscar by director Mervyn LeRoy. The emcee for the evening, comedian Bob Hope, lifted Margaret to the microphone so she could be heard by the listening radio audience. “Will you hurry up and grow up, please?” Hope said as he struggled with the young winner. However, she did know what to say. Her mother had written her an acceptance speech, but at the last-minute Margaret decided to improvise her very own thank you to the Academy. 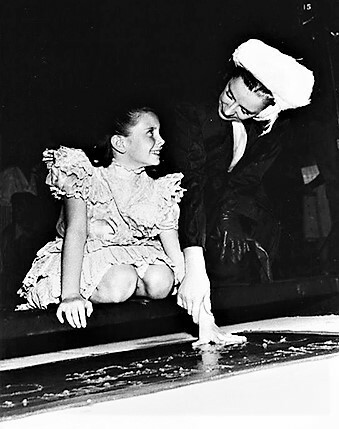 During her career, Margaret O’Brien was bestowed with many awards and accolades, including the honor of placing her hands and footprints in cement in the forecourt of Grauman’s Chinese, but the Oscar would be her most prized and valued possession. Unfortunately, the little statuette would not stay around for long. At the O’Brien home on Beverly Drive, Margaret had a separate room for her awards. One day in 1958, their maid took the Oscar and several other awards to her home to polish – a practice she did on several occasions. After three days, the maid failed to return so Mrs. O’Brien dismissed her and asked that she return the awards. Not long after, Mrs. O’Brien, who was not in good health, suffered a relapse and died. Grief stricken, Margaret forgot about the maid and her Oscar until several months later when she tried to contact her, only to find that her phone was disconnected. The maid had moved and did not leave a forwarding address. Margaret considered the Oscar was gone forever. A few years later, the Academy graciously replaced the award with a substitute, but it was not the same. Over the next thirty years, Margaret attended memorabilia shows searching for her lost Oscar. Then, in early 1995, a friend saw her Oscar in a an upcoming memorabilia auction catalogue. Margaret contacted the Academy’s legal department and they acted swiftly to have the Oscar returned. 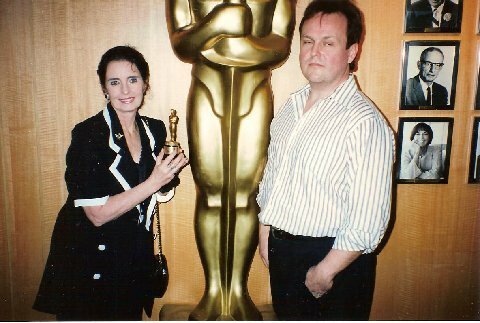 Margaret O’Brien with her stolen Oscar that was returned to her by the Academy, and me in my younger days (no I’m not drunk it’s just one-of-those-pics) Michael Schwibs photo. Margaret O’Brien: Edward Arnold would get fussy sometimes and get after me if I wasn’t listening in a scene. He’d look me in the eye and say, “Margaret, you’re not listening. Pay attention.” But, of course, he was right too. AE: Another child star you worked with twice was Butch Jenkins. Did you become friends? Margaret O’Brien: We were good friends, but we were not real close. He was real boyish and liked to play baseball, and I wasn’t interested in that. But we got along well. AE: How was it to work for MGM boss Louis B. Mayer? Margaret O’Brien: He was very nice to me. But a lot of people were really scared of him. He didn’t scare me, and my mother could walk in and be real independent. He could be very intimidating, especially if you asked for more money. It was like being taken to the guillotine. He governed it all, but he wouldn’t come down to the set much because his producers were pretty influential. That’s what made him more scary. There are lots of stories about Louis B. Mayer. 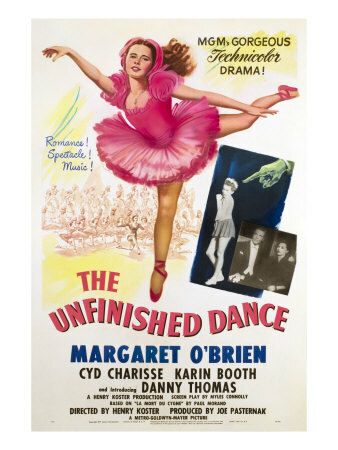 AE: Danny Thomas’ first film appearance was opposite you in “The Unfinished Dance” (1947). What was he like? Margaret O’Brien: Yes, that was Danny Thomas’ first film, and he was wonderful. Of course, he had kids of his own—he had a daughter my age, Marlo, who would come on the set sometimes. Marlo and I graduated our first Communion and Confirmation together, so we knew each other as we grew up. But Danny was great with kids—he was fun. AE: In the film “The Unfinished Dance,” you play a young ballerina. You did your own dancing, didn’t you? Margaret O’Brien: Yes, I loved doing that film because I came from a dancing family. At first the studio was going to use a double because they didn’t realize that I was a dancer, so they dismissed the double. There were lots of kids on that one which was fun, including Elinor Donahue, who became a good friend. We worked together again after that, and we still see each other from time to time. And I also got to wear these beautiful ballet costumes, which I loved. AE: Did your mother teach you the ballet? Margaret O’Brien: No, I had been to dancing school, but my mother was a dancer. She had taught me the flamenco and other dances, but not ballet. And my aunt (Marissa) was a Spanish dancer with Xavier Cugat for many years. He would have a Spanish dancer on his show at the Waldorf. And then my mother was a Spanish dancer with Eduardo Cansino, the father of Rita Hayworth. My mother even taught Rita some dances in her early years. AE: Were you friends with Rita Hayworth? Margaret O’Brien: No, I only met Rita Hayworth once during a pool party at Orson Welles’ house during the filming of Jane Eyre, and she was there. She knew my mother, of course, but not me. AE: So did you study ballet? Margaret O’Brien: I had not studied like the other kids, but I seemed to have a natural ability at dancing, so I learned all the steps in no time. In fact, the head of the Ballet Russe, who did most of the choreography wanted me to join the company. Of course, I wasn’t going to leave MGM, and the dancer’s life is very difficult. So, my mother said no. But I was really into the ballet at that time, carrying my toe shoes with me everywhere. 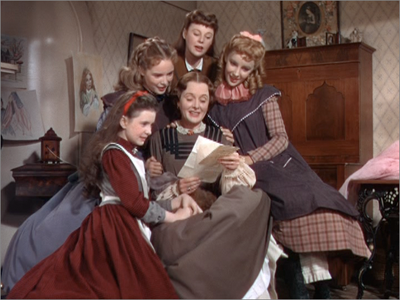 AE: Another one of your films which has become a classic is “Little Women” (1949). What was it like working on that film? AE: What was Elizabeth Taylor like? Margaret O’Brien: She was really fun to work with. I first worked with Elizabeth on Jane Eyre, but we didn’t have any scenes together. Speaking of costumes, usually I had to wear poor bedraggled clothes, but on Jane Eyre I got to be dressed up and wear the pretty ones. Well, I would see Elizabeth on the Fox lot, and I was just so happy I could put my nose in the air and go past her and Peggy Ann (Garner) because they had to wear the raggedy clothes. We were only kids, but Elizabeth was envious of me for once. But that changed on Little Women because now I envied her because she had her 18th birthday during the filming and didn’t have to go to school anymore. She threw away her school books and didn’t have the teacher following her every minute. That was a big deal for her because she really hated that school teacher. AE: How was Peter Lawford to work with? Margaret O’Brien: Peter Lawford was so handsome. All the girls had a crush on him, but I was out of the competition because I was only 11. I felt like an outcast, so I kind of spied on them to see who was going into whose dressing room. Peter had a wonderful time on that movie (laughs). AE: I understand there were some problems filming the scene where Jo (June Allyson) comes home after cutting off all her hair and selling it. Margaret O’Brien: We had to shoot that scene about a hundred times because Peter Lawford would break up and laugh every time he looked at her hair. And when he had to say that she looked like a porcupine, he would always say porky-pine. He couldn’t seem to say it right, and then everyone would start laughing. AE: Your last film at MGM, “The Secret Garden” (1949), has become a children’s classic and also one of my favorites. What are your remembrances of that film? Margaret O’Brien: I was so lucky to do all these films from great books that I had read. Doing this film made me very good in history because it would pique my interest to learn more about it. In The Secret Garden I loved playing the part in India—I’ve always enjoyed Indian antiques—I especially loved the dolls from the scene and was allowed to keep one, which I still have. And, there were two really nice boys in the film—Brian Roper, who was really from Yorkshire—I really liked him a lot. Then, of course, I had a big crush on Dean Stockwell—I thought he was so good looking. I always loved doing the English castle-type films. Again, I wished I had taken some of the things off the set of that one. AE: Do you still see Dean Stockwell and Brian Roper? Margaret O’Brien: Yes, and then I did a couple of television projects with Dean later on. I still had a crush on him for a long time. And Brian Roper I saw again several years ago. I was doing an appearance at a Palo Alto theater where they were showing The Secret Garden, and he was living near there. He was in the audience and came up to see me—just as nice as ever—and he still had a watch that my mother had given him on the last day of filming. If we were really close, we would give each other gifts when a film was finished—I still have the gift Dean gave me, a little gold good luck charm on a pin. AE: After you left MGM, is it true you were almost signed to be the voice for the Disney animated film “Alice In Wonderland” (1951)? 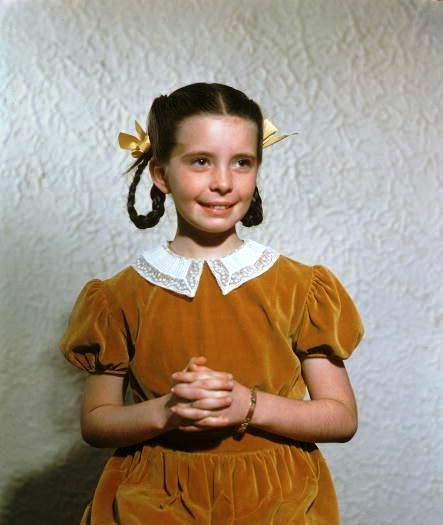 Margaret O’Brien: I almost did it, but another little girl who was under contract to MGM for a while did it. My mother had a big fight with Walt Disney. What it was all about I don’t know. I think it was over money. And he was going to sue us—it was a big deal. Somehow he didn’t, and at that point neither one of us wanted to do it. AE: Did you have a favorite film that you did at MGM? Margaret O’Brien: I’d say Little Women and The Secret Garden. Of course, Meet Me in St. Louis was fun too. Those were my three favorites. AE: Do you have a favorite actor that you worked with? Margaret O’Brien: It’s hard to say because I loved Lionel Barrymore, and I loved Charles Laughton. I loved Robert Young. They were all very special. It’s really hard to pick. I had very few that I did not like to work with. Some were not as warm, like Orson Welles, who kept a lot to himself, but he wasn’t mean to you. The only one that was difficult was Wallace Beery—that I worked with as a kid. Of course, I worked with some later that were pretty unpleasant. AE: Well, Margaret, I really appreciate you taking the time to discuss your career at MGM. Margaret O’Brien: I’ve enjoyed every minute. Thank you so much, Allan. 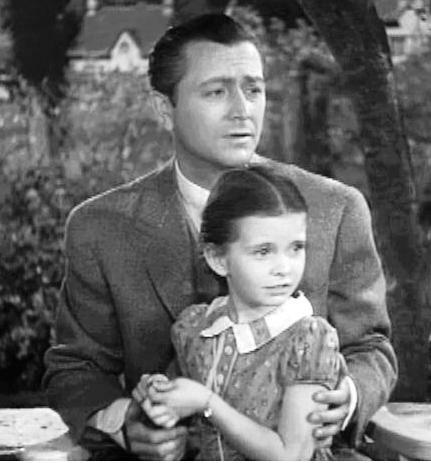 Margaret O’Brien continued to appear sporadically in films over the years, including one in Japan and two in Peru. However, her main body of work would be on the stage and in television, where she would work nonstop for the next decade. Margaret O’Brien is no longer a child star, but she still continues to shine. She lives today in the San Fernando Valley and occasionally accepts acting roles. Much of her time is spent lecturing on her film career or attending functions in Hollywood. She says she has no intention of ever retiring completely.